The car mounts high, high into an endless tunnel of verdant arches. Heavy foliage falls all around from lofty trees. Then, suddenly, a clearing. We’ve arrived at the resort on a family-owned colonial coffee plantation. The Raj-era estate has been around a century or more. 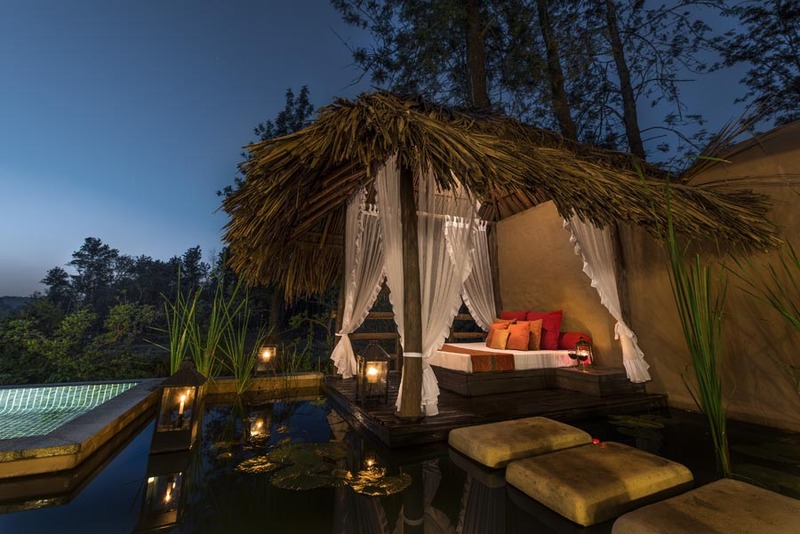 It’s the resort’s 20th birthday, for which it has offered itself titivation and pretty new lily pool villas. Tradition, however, persists in old-world hospitality. In the reception area I’m offered hot or cold coffee, made with beans from the plantation. A coffee fiend, I’d like both, but decide to behave. 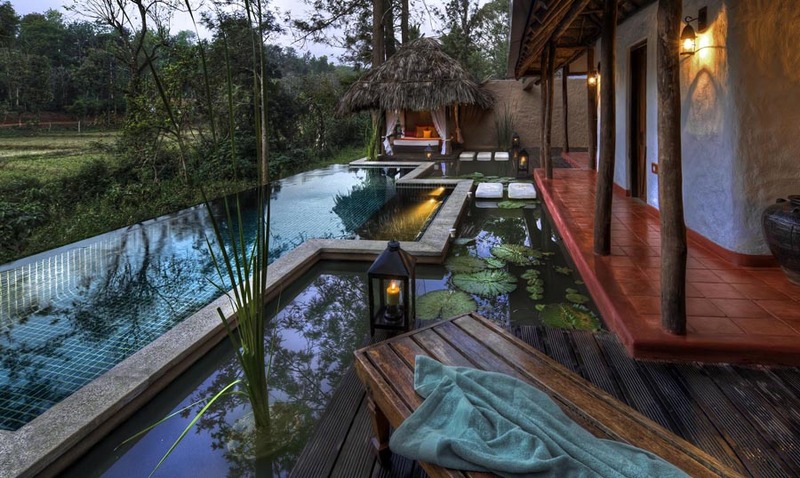 A swig of cold coffee and then Noor, the young front office manager, is waving me down tree-shaded ways to my ample private pool villa, which recreates the local kodava homes, with rust-red tiled floors, red-stone walls and and little indoors garden. The bedroom has a four-poster bed and vintage-style furniture. 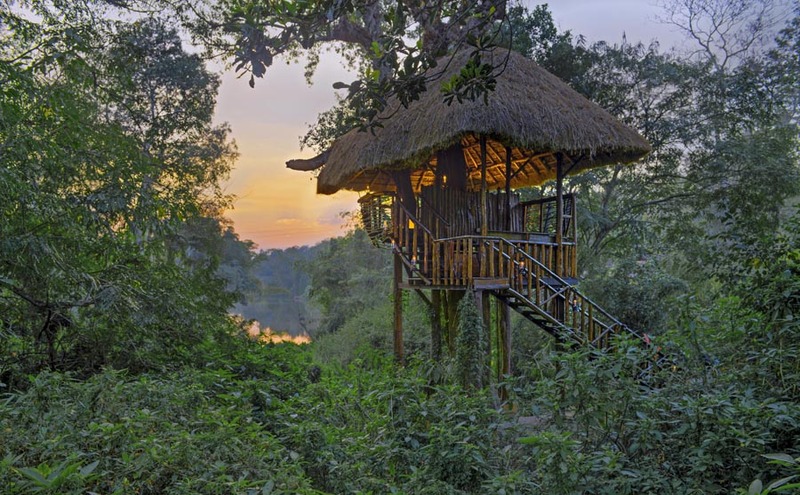 The loveliest amenity is the luxurious pooled garden with pillared verandas laced in a wooden fringe and towering trees that seem to kiss the stars. 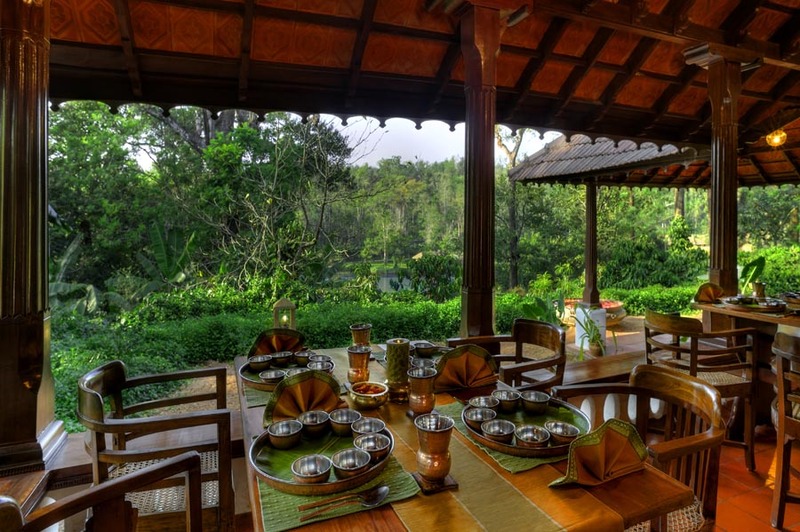 In this garden Exec Chef Siva Prasad conducts private suppers. At a live station, Coorgi specialities, which I insist on exploring, are prepared as a private butler to-and-fros from the stove to my beautifully set table, soon tessellated with cuisine that has its own strident identity, whilst attesting to influences from the neighbouring South Indian states of Kerala and Tamil Nadu. But distinctly indigenous are Coorgi soup, Coorgi curry and Coorgi staples, all invariably rice-based, be they steamed, roasted, fried, round, flat or quadrangular. “Coorgis are rice-eaters,” Chef establishes. No healthier staples possible, alas. I couldn’t care less if the fried jackfruit papadam and banana chips aren’t healthy. My fingers keep surreptitiously wondering towards them whilst the butler isn’t looking. When he asks if he could replenish the depleted dish, I feel rather foolish. If I have, as ever, vacillated in my choice of villa -the Coorgi Kodava villa I’m in or the new Lily Pool villa with its flowing, flowered waterbodies- then I’m pleased with my present domicile when I’m told that the garden Kodava Twilight private dining I’ve just experienced cannot be staged in the Lily Pool villa. For all its romance, you can’t sup in seclusion in the “honeymoon” haven. And yet, many are its seductions. 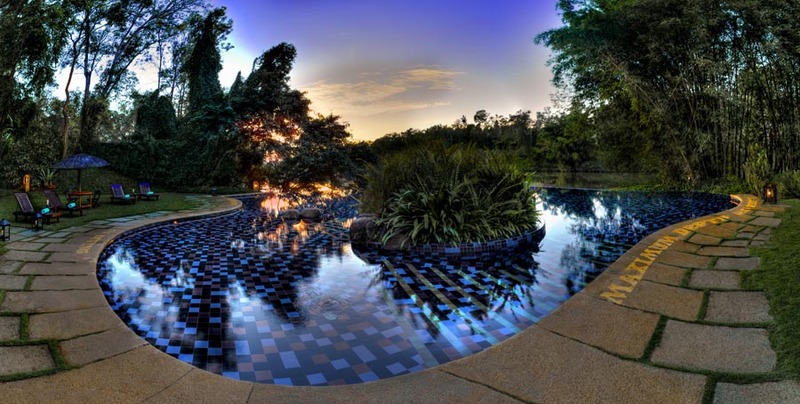 It has a pool you want to skinny-dip in and an inviting mattressed gazebo you want to hanky-panky in. But your amorous shenanigans might well have an avid audience- the villa’s flimsy bamboo fence conceals little from gardeners, workers and wandering guests. Staff swear vigorously that nobody would look, but live romance is surely hard to resist. And whilst young naturalist Pradeep engages one on bird-watching walks around the resort, one’s gaze would inevitably stray from the vibrant feathered fantasies that impassion Pradeep to the acrobatics of passionate love birds in the lilied villas. I wisely decide to restrict my love affair to the food. This is, after all, a culinary destination. If buffets are mostly vile, the lunch buffet at the resort’s all-day dining restaurant,The Granary, is a happy exception. The organic counter, which includes curries, pickles and dessert is rather addictive. Ask and chefs can even create an organic South Indian feast, with vegetables vitally fresh, strikingly hued and subtly flavoured. Whilst there is a dedicated vegetarian restaurant, Plantain Leaf, specialising in South Indian breakfasts and both South and North Indian thalis (traditional platters), I’m partial to The Granary’s leaner organic offerings. However, I frequent Plantain Leaf for authentic South Indian filter coffee presented in metal tumblers by waiters in ethnic attire — and then proceed to ransack The Granary’s terrific teatime coffee cookies. 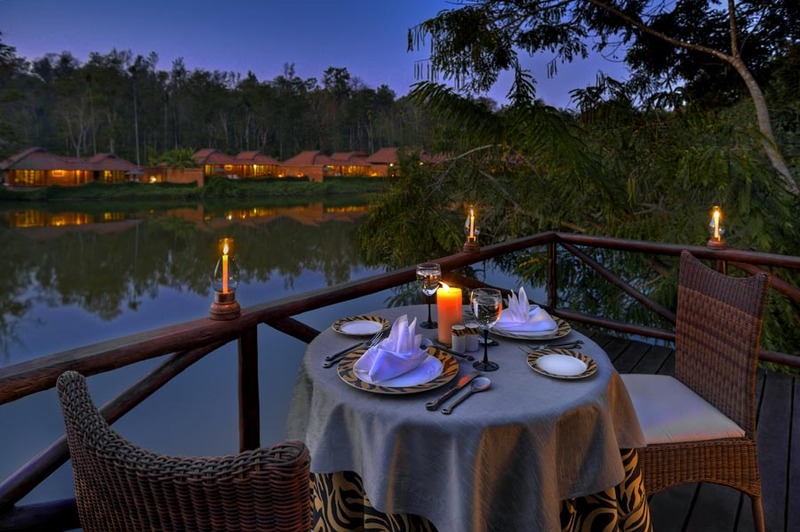 The only incentive for restraint is the impending bespoke South Indian fiesta arranged for me on a terrace overhanging the lake at the Peppercorn restaurant that’s lit only by lamps and candles. It’s normally a grill restaurant, but my epicurean eccentricities are humoured. Exclusively for me then: an excursive gourmet excursion into South India. We begin with curries Coorg is famous for: a spicy pork curry and dry, curry-leafed chicken curry with vegetarian versions in mushrooms and soya respectively. I’ve expressed an academic interest in the nuanced vastitude that is South Indian cuisine. Thus, the miscellany of ladies fingers prepared in three different styles representing three different Deccan states. Spinach, too, lends itself to multiple regional interpretations. 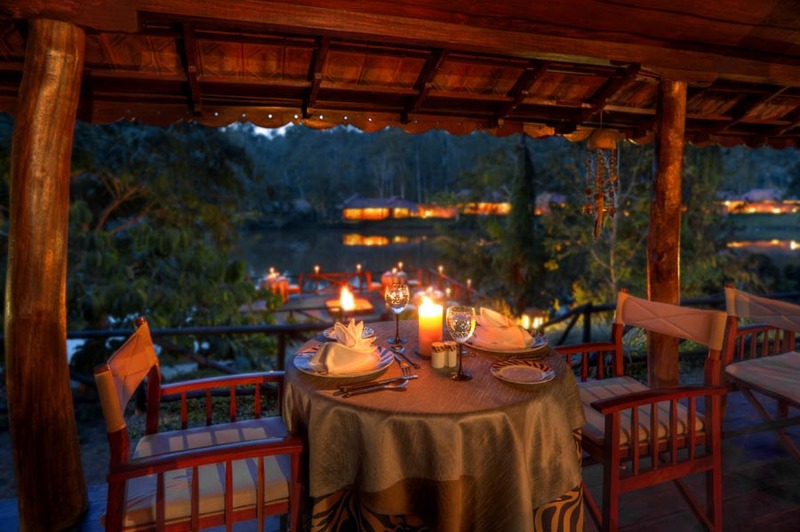 Exceptional meal in a madly romantic restaurant. If I thought the chef brigade couldn’t elevate their fare further, I’m propelled quite literally to culinary heights over the Machan treetop dinner. This time, the Exec Chef being from Kerala (even if his obliging deputy Dinesh is Bengali), it’s an all-Kerala affair, the highlight being coconut curry and nool puttu (soft little coiled nests of steamed rice strings on banana leaf). After all the gluttony, I convince myself I can kill the calories on nature walks in the forest. Naturalist Pradeep leads. We see fresh elephant and wild dog droppings. I ask: What if there’s a confrontation with the wild? Pradeep is unarmed. He assures me he hasn’t been attacked in six years. Any guarantee we couldn’t be now? No. I let myself be diverted by the tale of the holy river Cauvery, the Ganges of the South, that originates 80 kilometers from the resort at Tala Cauvery. Legend has it that the sage Agastya Muni was smitten by the beauteous Cauvery, Lord Brahma’s daughter. She agrees to marry Agastya on condition that he never abandon her. After their marriage, he wanders off to meditate, enclosing her in a little metal water jar. Absorbed as he is in meditation, he fails to return as pledged. Cauvery believes she is forsaken, topples out of the jar and turns into the gushing waters of the river Cauvery. Agastya returns, and, aghast at his loss, rushes to the river to pacify his sulking wife. So outraged is she by the betrayal that she expresses her fury by whipping her waters so violently that they turn back the pleats on the sarees of some kings bathing in the river. Hence, the Kodava people wear their sarees pleated backward. My head, too, is spinning after this myth. But well worth the scenic two-hour drive from the resort is the holy site, with two temples where water flows from the hilled temple to the one below, defying scientific explanation. Visit Kushalgiri, the second largest Tibetan settlement outside Tibet, where temples are adorned in stunning murals. The resort hosts cultural performances every evening. Though I usually spurn such shows as “touristy,” Orange County invites tribals, enabling them and their endangered art to survive whilst treating guests to authentic indigenous culture. Noor, the front office manager mentions that the resort dispensed with plastic-bottled water, sacrificing revenue to sustain the environment — and even uses fumes from their laundry to steam South Indian breakfast specialty, idli. “They are softer when made with laundry fumes, and when I know there’s idli in the staff canteen I ensure I breakfast at work.” The worthy recycling of laundry fumes earns Orange County a clean chit!